Well, so much for the beautiful weather. I think it has snowed 3 separate times since my post this morning! Just flurries, nothing stuck. And the wind is whipping so hard that its coming through cracks around my office windows. My hands are completely frozen and I have the heat set at 76*! :( Brian and I braved the cold to walk down the pedestrian mall for a lunch date. Lunch: We went to one of my favorite restaurants in downtown C'ville, Bizou. Here is what Food & Wine had to say about my little favorite in May 2004: "This downtown diner gets packed at lunchtime with University of Virginia faculty. The retro interior features red-leather booths and vintage movie posters. There's roasted chicken and grilled rib eye, but Bizou's specialty is its succulent homemade meat loaf with chipotle ketchup (119 W. Main St.; 434-977-1818)." Their gourmet down-home cooking is to-die-for, especially on blustery days like today. They have my favorite summer meal, a golden beet salad with fresh chevre and their house-made honey mustard dressing. It is SO good. I was surprised that it was still on the menu today, but I was craving something warm and filling so I got their veggie burrito instead. I'm sorry about the picture quality, I only had my iphone and the restaurant is pretty dark inside. 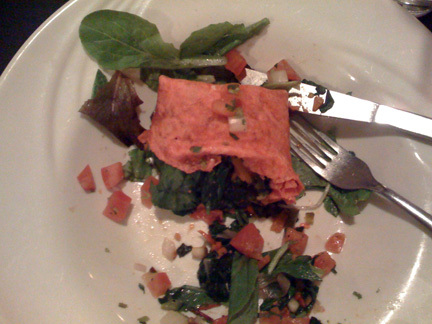 No cheese or sour cream inside, just wonderful sauteed greens and veggies. I found lots of spinach, brussels sprout leaves, onions, carrots, corn and diced tomato inside. And I asked for the creme fraiche on the side...normally they drizzle it all over the top. 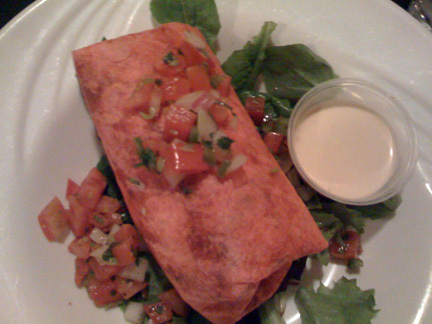 The burrito is so good though that I think I only drizzled the spicy, creamy sauce on two bites. I finished everything on my plate. Yum. 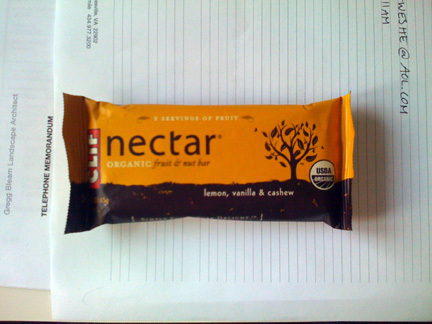 For an afternoon snack I have a Clif Nectar bar, but we typically have wine and cheese in my office on Friday afternoons so I may hold off on snacking on the bar until I know if we're doing that today.